The Baltimore Ravens defeated the Denver Broncos, 27-14, continuing the third full week of action in the NFL. Offensive tackle Garett Bolles is a polarising player. At times, he flashes his incredible power in the ground game, but he ends up on the deck far too often, frequently overcommitting in both pass protection and as a run blocker. A couple holding penalties were particularly costly, and he generally struggled throughout the game when required to drop back. Bolles needs a ton of technical work but has all the raw tools. Royce Freeman took advantage of Phillip Lindsay‘s ejection with a fine performance in his own right. He generated tough yardage after contact and finished his runs with authority. Although a completely different type of back to Lindsay, the Broncos could use a back of his style to wear down defenses late in games. Rookie first-round draft pick Bradley Chubb notched a sack in a productive pass-rushing game. Chubb made a hard inside move on tackle Ronnie Stanley to corral Joe Flacco who had stepped up inside the pocket. Shane Ray generated the other sack for the Broncos’ defense with his strip-sack of Joe Flacco. Ray beat guard Alex Lewis to the outside for the sack, which stalled a promising second-quarter drive. Joe Flacco took care of the ball against the Broncos’ talented secondary; he didn’t throw any interceptions and collected one touchdown pass. Michael Crabtree appears to be Flacco’s favorite intermediate target with John Brown getting the bulk of the deep shot attempts. Alex Collins continues to get the bulk of the carries for the Ravens’ offense. Collins wasn’t overly productive on his touches but did score a touchdown and caught three passes as a receiver out of the backfield. The Ravens defensive scheme puts a lot of strain on the secondary, and it’s not clear the Ravens have the talent on the back end to rise to the challenge. Brandon Carr struggled throughout, and Marlon Humphrey wasn’t much better, but drops and inaccurate throws prevented Denver from putting up more points. Baltimore are desperate for an elite man-to-man corner, to allow them the freedom to creatively blitz on the front end. Patrick Onwuasor is emerging as Baltimore’s top linebacker. He certainly made the game-defining play against Denver, picking off quarterback Case Keenum in the red zone in the fourth quarter. Although less effective on the front foot, Onwuasor provides a solid foundation piece to build the spine of the defense. Denver: Denver ran the ball efficiently, but struggled mightily playing from behind. Their offensive tackles did them no favors this afternoon, and the Ravens defense capitalized on that. 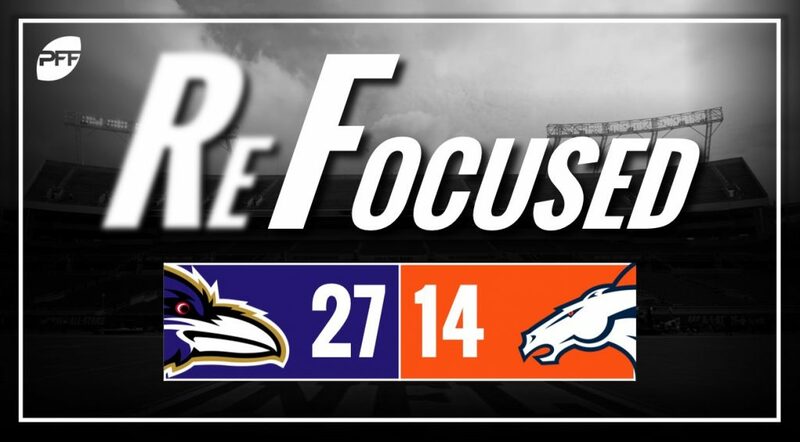 Baltimore: The Ravens’ offense was efficient enough to pull out the victory against the stout Broncos’ defense.